Will Yutu Phone Home ? Will ‘Yutu’ phone home? Will Yutu live to see another Earthrise? Those are the million dollar questions we’re all awaiting the answer to on pins and needles as Lunar Day 3 begins for China’s world famous ‘Yutu’ moon rover and Chang’e-3 lander, following a significant malfunction as night fell two weeks ago. With the Sun due to rise over the Mare Imbrium landing site, China’s maiden pair of lunar probes are due to awaken at any moment now – and hopefully send good news. Yutu – which means ‘Jade Rabbit’- and the mothership lander have been sleeping through the utterly frigid two week long lunar night since they entered their second hibernation period on Jan. 24th and 25th respectively, according to Chinese space agency officials. No communications are possible during the period of dormancy. To get a clear view of Yutu’s traverse across the Moon’s magnificently desolate gray plains, be sure to check out our timelapse panoramic mosaic showing the rover’s movements at three different positions around the stationary lander – above and below. This 360-degree time-lapse color panorama from China’s Chang’e-3 lander shows the Yutu rover at three different positions during its trek over the Moon’s surface at its landing site from Dec. 15-22, 2013 during the 1st Lunar Day. The 360 degree panorama by the imaging processing team of Ken Kremer and Marco Di Lorenzo was also newly featured on Astronomy Picture of the Day (APOD) on Feb 3, 2014. However, as I reported earlier here, Yutu suffered a rather serious mechanical anomaly just as the sun was setting and causing China’s moon mission team to urgently sprang into action. “Scientists are organizing repairs,” wrote the People’s Daily, the official government newspaper of China’s ruling Communist Party. Apparently one of the solar panels did not fold back properly over Yutu’s instrument laden mast after it was lowered to the required horizontal position and into a warmed electronics box to shield and insulate it from the extremely frigid lunar night time temperatures. The potentially deadly malfunction could spell doom for the unprotected mast mounted instruments and electronic systems, including the color and navigation cameras and the high gain antenna, if true. During each 14 Earth-day long night, the Moon’s temperatures plunge dramatically to below minus 180 Celsius, or minus 292 degrees Fahrenheit. A radioisotopic heater unit keeps the Mast instruments warm, during lunar night, in the absence of solar power. Dust accumulation on the rover and gears may possibly be to blame for the failure to retract, based on unofficial accounts. China has not released any official or detailed information on the cause of the malfunction or recovery actions taken by Chinese space engineers. So, no one knows the ‘Jade Rabbits’ fate at this time. ‘Jade Rabbit’ has been immensely popular with the Chinese public. Over 36,000 well wishes were posted on an unofficial Sina Weibo account shortly after word of the mechanical anomaly was announced. Lunar Day 3 at Mare Imbrium was due to start around this past weekend Feb. 8 or 9. An anonymous writer on Weibo, China’s twitter equivalent, reported; “We will hopefully get back news of the rabbit after sunrise today February 10 at 15:00 hrs (3 pm), Beijing local time, and confirm whether safe or unable to move.” That is according to a google translation I used. Both vehicles depend on their life giving solar panels to produce power in order to function and accomplish their scientific tasks during each Lunar day which lasts approximately 14 days. They had been functioning perfectly and collecting science measurement as planned during Lunar Day 2. ‘Jade Rabbit’ had departed the landing site forever, and was journeying southwards as the incident occurred – about six weeks into its planned 3 month long moon roving expedition. In a historic feat for China, the Chang’e-3 spacecraft safely touched down on the Moon at Mare Imbrium near the Bay of Rainbows some two months ago on Dec. 14, 2013 . Seven hours later, the piggybacked 140 kg Yutu robot drove off a pair of ramps, onto the Moon and into the history books. The 1200 kg stationary lander is expected to return science data about the Moon and telescopic observations of the Earth and celestial objects for at least one year. Chang’e-3 and Yutu landed on a thick deposit of volcanic material. The hugely popular probes could be the forerunners to a manned Chinese Moon landing mission a decade from now. Stay tuned here for Ken’s continuing Chang’e-3, Orion, Orbital Sciences, SpaceX, commercial space, LADEE, Mars and more planetary and human spaceflight news. LADEE, NASA’s latest lunar orbiter, is getting a new lease on life and will live a little longer to study the mysteries of the body’s tenuous atmosphere, or exosphere, and make surprising new discoveries while hugging Earth’s nearest neighbor even tighter than ever before, the team told Universe Today. NASA has announced that the Lunar Atmosphere and Dust Environment Explorer (LADEE) mission will be granted a month long extension since the residual rocket fuel is more than anticipated due to the expertise of LADEE’s navigation engineers. This is great news because it means LADEE’s three research instruments will collect a big bonus of science measurements about the pristine lunar atmosphere and dust during an additional 28 days in an ultra tight low orbit skimming around the Moon. And the extension news follows closely on the heels of LADEE being photographed in lunar orbit for the first time by a powerful camera aboard NASA’s five year old Lunar Reconnaissance Orbiter (LRO), her orbital NASA sister – detailed here. LADEE is currently flying around the moon’s equator at altitudes ranging barely eight to 37 miles (12-60 kilometers) above the surface which crosses over from lunar day to lunar night approximately every two hours. During the extended mission lasting an additional full lunar cycle, LADEE will fly even lower to within a few miles (km) thereby allowing scientists an exceptional vantage point to unravel the mysteries of the moon’s atmosphere. Just how low will LADEE fly? I asked Rick Elphic, LADEE project scientist at NASA Ames Research Center, Moffett Field, Calif.
“We will be taking LADEE from its nominal 20 to 50 kilometer periapsis right down to the treetops — we want to get data from 5 kilometers or even less!” Elphic told me. With the measurements collected so far the science team has already established a baseline of data for the tenuous lunar atmosphere, or exosphere, and dust impacts, says NASA. Therefore the LADEE team is free to fly the spacecraft much lower than ever before. And why even go to lower altitudes? I asked Elphic. Basically because the team hopes to see changes in the particle density and composition. “LDEX (The Lunar Dust Experiment) will be measuring dust densities very close to the surface, and we will see if something new shows up. 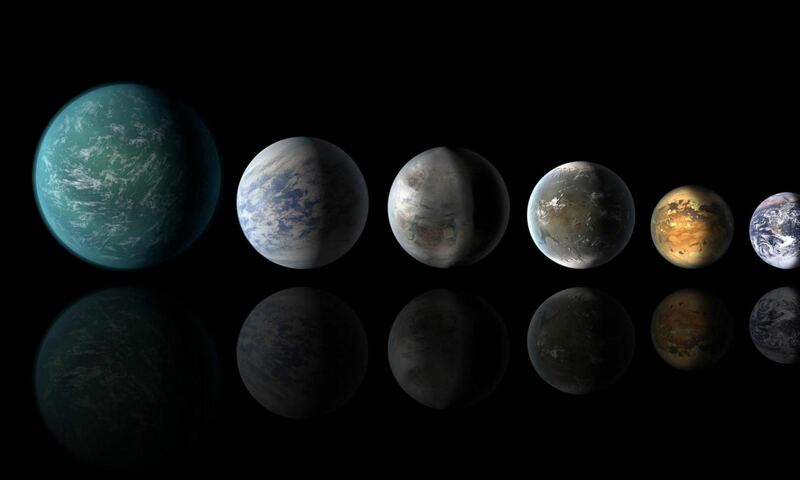 Each time we’ve dropped our orbit down to lower altitudes, we’ve been surprised by new things,” Elphic told Universe Today. The Neutral Mass Spectrometer (NMS) instrument will measure the identity and abundances of the exospheres constituents, such as argon, neon and krypton. 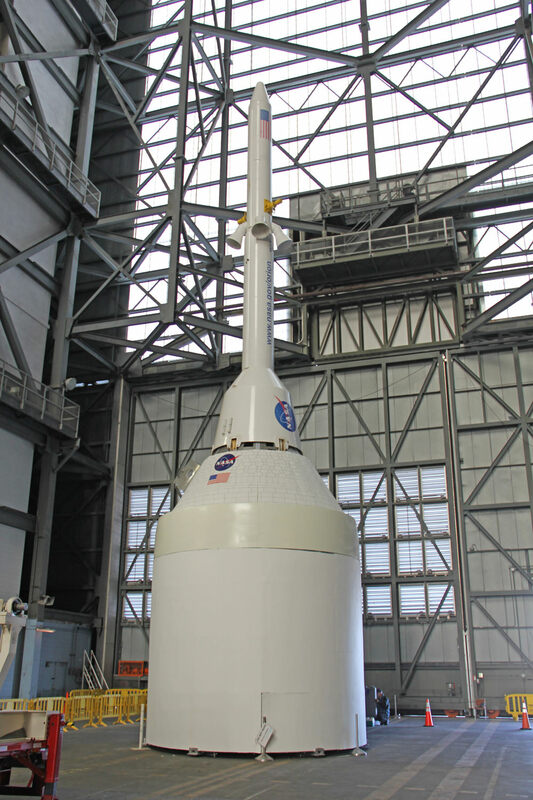 With the extension, LADEE is expected to continue capturing data in orbit until about April 21, 2014, depending on the usage of the declining on board fuel to feed its maneuvering thrusters. “LADEE is investigating the moons tenuous exosphere, trace outgases like the sodium halo and lofted dust at the terminator,” Jim Green, Planetary Science Division Director at NASA HQ, told me earlier in an exclusive interview. The Lunar Dust Experiment (LDEX) recorded dust impacts as soon as its cover opened, says NASA and is also seeing occasional bursts of dust impacts caused by meteoroid showers, such as the Geminids. By studying the raised lunar dust, scientists also hope to solve a 40 year old mystery – Why did the Apollo astronauts and early unmanned landers see a glow of rays and streamers at the moon’s horizon stretching high into the lunar sky. The science mission duration had initially been planned to last approximately 100 days and finish with a final impact on the Moon on about March 24th. And the team had told me before launch that an extension was rather unlikely since the spacecraft would be flying in such a very low science orbit of about 50 kilometers altitude above the moon that it will require considerable fuel to maintain. “LADEE is limited by the amount of onboard fuel required to maintain orbit,” Doug Voss, launch manager, Wallops, told me. So what accounts for the extension? Basically it’s because of the expert navigation by NASA’s engineers and the Orbital Sciences Minotaur V rocket and upper stages following the spectacular night time LADEE blastoff from NASA Wallops, VA, on Sept. 6, 2013 and subsequent insertion into lunar orbit. “The launch vehicle performance and orbit capture burns using LADEE’s onboard engines were extremely accurate, so the spacecraft had significant propellant remaining to enable extra science,” said Butler Hine, LADEE project manager at NASA’s Ames where the mission was designed, built, tested, in a NASA statement. “LADEE launched with 134.5 kilograms of fuel. After the third lunar orbit insertion burn (LOI-3), 80% of our fuel had been consumed,” said Dawn McIntosh, LADEE deputy project manager at NASA Ames Research Center, in an exclusive interview with Universe Today. “Additional orbit-lowering maneuvers with the orbital control system (OCS) and reaction control system (RCS) of approximately 40 seconds were used to get LADEE into the science orbit. And LADEE’s orbit capture was accomplished amidst the ridiculous US government shutdown with a skeleton crew. The spacecraft finally entered its planned two hour science orbit around the moon’s equator on Nov. 20. So LADEE’s orbital lifetime depends entirely on the remaining quantity of rocket fuel. “LADEE has about 20 kg of propellant remaining today,” Butler Hine told Universe Today. The 844 pound (383 kg) robot explorer is the size of a couch and was assembled at NASA’s Ames Research Center, Moffett Field, Calif., and is a cooperative project with NASA Goddard Spaceflight Center in Maryland. The $280 million probe is built on a revolutionary ‘modular common spacecraft bus’, or body, that could dramatically cut the cost of exploring space and also be utilized on space probes to explore a wide variety of inviting targets in the solar system. To date LADEE has traveled over 1 million miles and in excess of 1200 equatorial orbits around the Moon. LADEE is also searching for any changes caused to the exosphere and dust by the landing of China’s maiden Chang’e-3 lander and Yutu moon rover in December 2013. Stay tuned here for Ken’s continuing LADEE, Chang’e-3, Orion, Orbital Sciences, SpaceX, commercial space, Mars rover and more news. China’s Chang’e-3 lander and Yutu moon rover have been imaged from above and below – in one of those rare, astounding circumstances when space probes from Earth are exploring an extraterrestrial body both from orbit and the surface. And it’s even more amazing when these otherworldly endeavors just happen to overlap and involve actual work in progress to expand human knowledge of the unknown. And it’s even rarer, when those images stem from active space probes built by two different countries on Earth. Check out our composite mosaic (above) combining the view from the Moon’s orbit snapped by the hi res camera aboard NASA’s Lunar Reconnaissance Orbiter (LRO) with our new color panoramas from the Moon’s surface, compiling imagery from the landing site of China’s Chang’e-3 lander – with Yutu in transit in mid-Dec. 2013 soon after the successful touchdown. See below an earlier composite mosaic using the first black and white panorama from the Chang’e-3 Moon lander. The composite mosaic combines the efforts of Mark Robinson, Principal Investigator for the LRO camera, and the imaging team of Ken Kremer and Marco Di Lorenzo. On Christmas eve, Dec. 24, 2013, NASA’s LRO captured it’s first images of China’s Chang’e-3 lander and Yutu moon rover – barely 10 days after the history making touchdown on Mare Imbrium (Sea of Rains) and just 60 meters east of the rim of a 450 meter diameter impact crater. LRO was orbiting about 150 kilometers above Chang’e-3 and Yutu when the highest resolution orbital image was taken on 24 December 22:52:49 EST (25 December 03:52:49 UT). The orbital imagery was taken by the LRO orbiters high resolution Lunar Reconnaissance Orbiter Camera (LROC) – specifically the narrow angle camera (NAC). See below my pre-launch cleanroom photo of LRO and the LROC cameras and other science instruments. The Chang’e-3 lander color panorama shows the Yutu rover after it drove down the ramp to the moon’s surface and began driving a significant distance around the landers right side on its journey heading southwards. Yellow lines connect craters seen in the lander panorama to those seen in the LROC hi res NAC image from LRO, in the composite view. Robinson identified the lunar craters and determined the field of view on the LROC image. The LRO image was taken at a later date (on Christmas eve) after the rover had already moved. Red lines on the orbital image indicate the approximate field of view of what is seen in the Chang’e-3 lander panorama. Although Yutu is only about 150 cm wide – which is the same as the pixel size – it shows up in the NAC images for two reasons. “The solar panels are very effective at reflecting light so the rover shows up as two bright pixels, and the Sun is setting thus the rover casts a distinct shadow (as does the lander),” says NASA in a statement. In a historic first for China, the Chang’e-3 spacecraft safely touched down on the Moon at Mare Imbrium near the Bay of Rainbows nearly seven weeks ago on Dec. 14, 2013. Yutu was about 10 meters away from the 1200 kg stationary lander when the lander panoramic images were taken. The lander and Yutu were just completing their 1st Lunar Day of explorations when the LROC images were taken, and entered their first period of hibernation soon thereafter on Dec. 25 (Christmas Day) and Dec 26 respectively coinciding with the start of their 1st Lunar Night. Both spacecraft awoke and functioned well during their 2nd Lunar Day, which just ended. However, Yutu’s future mission is now in jeopardy following a serious mechanical anomaly this past weekend as both vehicles entered their 2nd hibernation period. Apparently one of the solar panels did not fold back properly – perhaps due to dust accumulation – and its instruments may not survive. Read my full story for complete details – here. Yutu’s fate will remain unknown until the 3rd Lunar Day starts around Feb. 8 or 9. So, What’s the terrain like at the Mare Imbrium landing site? Chang’e-3 landed on a thick deposit of volcanic material. “A large scale wrinkle ridge (~100 km long, 10 km wide) cuts across the area and was formed as tectonic stress caused the volcanic layers to buckle and break along faults. Wrinkle ridges are common on the Moon, Mercury and Mars,” says Robinson. Older red mare about from 3.5 billion years is only 10 km to the north, he notes. Stay tuned here for Ken’s continuing Chang’e-3, Orion, Orbital Sciences, SpaceX, commercial space, LADEE, Mars and more news. China’s maiden moon rover ‘Yutu’ has just suffered a significant mechanical setback right at the start of her 2nd lunar night, according to an official announcement from Chinese space officials made public this weekend. The six wheeled Yutu rover, which means ‘Jade Rabbit’, has “experienced a mechanical control abnormality” in a new report by China’s official government newspaper, The People’s Daily. ‘Jade Rabbit’ was traversing southwards from the landing site as the incident occurred just days ago – about six weeks into its planned 3 month moon roving expedition. However very few details have emerged or been released by the Chinese government about Yutu’s condition or fate. “Scientists are organizing repairs,” wrote the People’s Daily. The abnormality occurred due to the “complicated lunar surface environment,” said the State Administration of Science, Technology and Industry for National Defence (SASTIND) in a brief statement, without giving further details, according to the paper. This situation is very serious because the “abnormality” took place just prior to the beginning of the 2nd lunar night and unavoidable ‘dormancy’ for both ‘Jade Rabbit’ and the Chang’e-3 mothership. So it’s not clear at this time if Chinese space engineers were able to take any concrete actions to rectify the unspecified problem before both spacecraft entered their next two week long night time slumber. Based on unofficial accounts, it appears that one of the solar panels did not fold back properly over Yutu’s mast after it was lowered to the required horizontal position into a warmed box to shield and protect it from the extremely frigid lunar night time temperatures. That could potentially spell doom for the mast mounted instruments and electronic systems, including the color and navigation cameras and the high gain antenna, if true. The now world famous rover entered its second hibernation period at dawn on Saturday, Jan. 25, as the lunar night fell, according to the SASTIND statement. The mothership “fell asleep” a day earlier on Friday, Jan 24. Each ship had just completed their 2nd Lunar Day of operations and had apparently been functioning normally and taking planned scientific measurements and imagery. The research program during Lunar Day 2 included optical telescope observations of the sky, extreme ultraviolent (EUV) observations of the Earth’s plasmasphere, subsurface radar measurements, and spectroscopic measurements with Yutu’s robotic arm. Likewise, each Lunar night also lasts approximately 14 Earth days. In order to survive into the next Lunar day, they must each endure the utterly harsh and unforgiving lunar environment when the Moon’s temperatures plunge dramatically to below minus 180 Celsius, or minus 292 degrees Fahrenheit. So they must enter a sleep mode to conserve energy since there is no sunlight to generate power with the solar arrays during the lunar night. During the nocturnal hiatus they are kept alive by a radioisotopic heat source that keeps their delicate computer and electronics subsystems warmed inside a box below the deck. It must be maintained at a temperature of about minus 40 degrees Celsius to prevent debilitating damage. In a historic first for China, the Chang’e-3 spacecraft safely touched down on the Moon at Mare Imbrium near the Bay of Rainbows some six weeks ago on Dec. 14, 2013. Is it Farewell Forever Yutu ?? And since there is no communication possible during sleep mode, no one will know until the resumption of daylight some two weeks from now – around Feb. 8 to 9. Whatever happens, China can be proud of their magnificent accomplishment with the Yutu rover and the 1200 kg stationary Change’-3 lander which has reinvigorated lunar surface exploration after a nearly 40 year gap. And we wish China’s scientists and engineers well ! Meanwhile as we await the fate of China’s Yutu rover trundling across pitted moonscapes, NASA’s Opportunity rover is in the midst of Martian mountaineering at the start of Decade 2 on the Red Planet and younger sister Curiosity is speeding towards the sedimentary layers of Mount Sharp. This time-lapse color panorama from China’s Chang’e-3 lander shows the Yutu rover at two different positions during its trek over the Moon’s surface at its landing site from Dec. 15-18, 2013. This view was taken from a 360-degree panorama – see below. A new time-lapse photomosaic shows China’s Yutu rover dramatically trundling across the Moon’s stark gray terrain in the first week after she rolled all six wheels onto the desolate lunar plains. Our complete time-lapse mosaic (see below) shows Yutu at three different positions trekking around the landing site, and gives a real sense of how it is maneuvering around – on the 1st Lunar Day. The 360-degree panoramic mosaic was created from images captured by the color camera aboard China’s Chang’e-3 lander, the country’s first spacecraft to successfully soft land on the Moon. The time-lapse mosaic was stitched together by the imaging team of scientists Ken Kremer and Marco Di Lorenzo using images just released on a Chinese language website. We integrated the wide screen panorama with additional images of Yutu taken by the lander as she roved around the right side of the mothership during her 1st Lunar Day – to create the new time-lapse panorama. To me the moonscape is rather reminiscent of the scenery from NASA’s manned Apollo lunar landing missions which took place over 4 decades ago – from 1969 to 1972. Our time-lapse Yutu mosaic was initially featured at NBC News by Alan Boyle – here. The first portrait of Yutu was taken shortly after it first drove off the 1200 kg Chang’e-3 lander on Dec. 15. The last Yutu position shows her heading off to the south and departing the landing site forever. She’s not ever coming back to see the stationary lander again, according to China’s Chang’e-3 mission team. Yutu, which translates as ‘Jade Rabbit’, is on her own from now on. Chang’e-3 safely touched down on the Moon at Mare Imbrium near the Bay of Rainbows on Dec. 14, 2013. Here is the initial black and white panoramic version from the Chang’e-3 navigation camera – which we assembled from screenshots taken as it was twirling about in a CCTV news video report. The Chang’e-3 mothership and Yutu rover are now working during their 2nd Lunar Day, having survived the harsh extremes of their 1st Lunar Night when temperatures plummeted to below minus 180 degrees Celsius, or minus 292 degrees Fahrenheit. They have resumed full operation and are conducting research investigations. Each is equipped with four science instruments. All the equipment is functioning well except alas for the color camera used to snap the images for the photomosaics herein. China’s official Xinhua new agency reports that the instruments aboard the lander and rover have each collected a large amount of data about the Moon, Earth and celestial objects. Scientists have created a star atlas around the constellation Draco and used the ground penetrating radar to survey the moon’s subsurface and soil structure to depths of 10 to 140 meters. Meanwhile as China’s Yutu rover trundles across pitted moonscapes, NASA’s Opportunity rover is in the midst of Martian mountaineering at the start of Decade 2 on the Red Planet and younger sister Curiosity is speeding towards the sedimentary layers of Mount Sharp. Chinese space officials have at last released much higher quality versions of the 1st color imagery captured by China’s first spacecraft to soft land on the surface of the Earth’s Moon; Chang’e-3. For the enjoyment of space enthusiasts worldwide, we have assembled the newly released imagery to create the ‘1st 360 Degree Color Panorama from China’s Chang’e-3 Lunar Lander.’ See above and below two versions in full resolution, as well as an interactive version – showing the fabulous view on the 1st Lunar Day. The moonscape panorama shows the magnificent desolation of the pockmarked gray lunar plains at the mission’s touchdown site at Mare Imbrium. It is starkly reminiscent of NASA’s manned Apollo lunar landing missions which took place over 4 decades ago – from 1969 to 1972. And this spectacular view may well be a harbinger of what’s coming next – as China’s leaders consider a manned lunar landing perhaps a decade hence, details here. See above a cropped portion – focusing on the piggybacked ‘Yutu’ lunar rover and the impressive tracks it left behind after it initially rolled all six wheels onto the surface; and which cut several centimeters deep into the loose lunar regolith on Dec. 15, 2013. The beautiful imagery snapped by China’s history making Chang’e-3 lunar lander on 17 and 18 December 2013 – during its 1st Lunar day – was released in six separate pieces on the Chinese language version of the Chinanews website, over the weekend. See below the compete version of the 360 degree panorama stitched together by the imaging team of scientists Ken Kremer and Marco Di Lorenzo. We have also enhanced the imagery to improve contrast, lighting and uniformity to visibly reveal further details. For comparison, below is the initial black and white panoramic version seen by the landers navigation camera – which we assembled from screenshots taken as it was twirling about in a CCTV news video report. Alas, one bit of sad news is that it appears the 1200 kg lander’s color camera apparently did not survive the 1st frigid night since it reportedly wasn’t protected by a heater. For a collection of new and higher quality Chang’e-3 mission photos – including the 1st portraits of the Earth taken from the Moon’s surface in some 40 years – please check my recent article; here. Check this link – to view a 360 degree interactive version of the first Chang’e-3 color panorama – created by space enthusiast Andrew Bodrov. He has added in a separate image of the Earth snapped by the lander. China’s action to release higher quality imagery is long overdue and something I have urged the Chinese government to do on several occasions here so that everyone can marvel at the magnitude of China’s momentous space feat. We applaud the China National Space Administration (CNSA) for this new release and hope they will publish the higher resolution digital versions of all the imagery taken by the Chang’e-3 mothership and the Yutu rover and place everything onto a dedicated mission website – just as NASA does. Here’s the pair of polar views of the 360 degree lunar landing site panoramas (released last week) – taken by each spacecraft and showing portraits of each other. China’s history making moon robots – the Chang’e-3 lander and Yutu rover – are now working during their 2nd Lunar Day. They have resumed full operation – marking a major milestone in the new mission. It’s remarkable to consider that although they were just awoken last weekend on Jan. 11 and Jan. 12 from the forced slumber of survival during their long frigid 1st lunar night, they are now already half way through Lunar Day 2 – since each day and night period on the Moon lasts two weeks. Little by little we’re getting sharper, clearer pictures from the Chinese Chang’e 3 moon mission. Yesterday the lander beamed back a series of new photos taken with its panoramic camera. Stitched together, they give us a more detailed and colorful look of the rover’s surroundings in northern Mare Imbrium. I’ve ordered the images starting with a nice crisp view of the Yutu rover; from there we turn by degree to the right across the five frames. The final mosaic unfortunately doesn’t have the resolution yet of the other images. Perhaps one will be published soon. One thing that stands out to my eye when looking at the photos is the brown color of the lunar surface soil or regolith. Color images of the moon’s surface by the Apollo astronauts along with their verbal descriptions indicate a uniform gray color punctuated in rare spots by patches of more colorful soils. The famous orange soil scooped up by Apollo 17 astronaut Eugene Cernan comes to mind. Because Apollo visited six different moonscapes – all essentially gray – it makes me wonder if the color balance in the Chinese images might be off. Or did Chang’e 3 just happen to land on browner soils? Nearly a month after the stunningly successful soft landing on the Moon by China’s first lunar mission on Dec. 14, 2013, the Chinese Academy of Sciences has at last released far higher quality digital imagery snapped by the Chang’e-3 lander and Yutu moon rover. This release of improved images is long overdue. And perhaps the best news of all involves a belated Christmas present to humanity – the publication of never before seen and absolutely stunning images of the Earth from the Moon captured by the lander on Christmas Day 2013. We haven’t seen the Earth from the Moon’s surface in 4 decades – not since the 1970’s. Until now, most of the Chang’e-3 mission images we’ve seen have essentially been rather low resolution pictures of pictures – that is screenshots or photos taken of the imagery that has been flashed onto large projection screens at the Beijing Aerospace Control Center, and then distributed by Chinese government media outlets. So they have been degraded several times over. I’ve collected a gallery of the new Chang’e-3 lunar photos here for all to enjoy – see above and below. The gallery includes photos taken during the final moments of the descent and landing on Dec. 14, 2013, as well as portraits and 360 degree moonscape panoramas taken by both spacecraft after Yutu rolled its wheels onto the loose lunar soil 7 hours later on Dec. 15, and the fabulous new images of Earth in visible and UV light. Yutu and the lander are about to awaken from their self induced slumber which began at Christmas time to coincide with the dawn of the the utterly frigid two week long lunar night. Temperatures plunged to below minus 180 degrees Celsius. They went to sleep to conserve energy since there is no sunlight to generate power with the solar arrays. 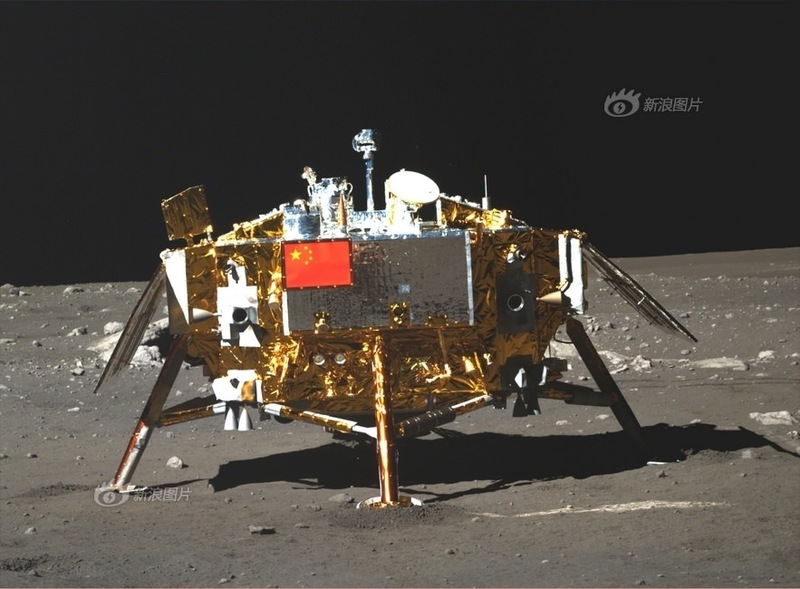 After driving off the lander, Yutu – which means ‘Jade Rabbit’ – drove in a semicircle around the lander and headed south. Jade Rabbit stopped at 5 designated places. The pair of Chinese spacecraft then snapped images of one another at each location. Some of those images were included in this new batch. Here’s a pair of very cool 360 degree panoramas – taken by each spacecraft and showing the other. Finally here’s imagery taken during the landing sequence by the descent imager in the final minutes before touchdown at Mare Imbrium, nearby the Bay of Rainbows, or Sinus Iridum region. It is located in the upper left portion of the moon as seen from Earth. You can easily see the landing site with your own eyes. And be sure to check my earlier story with an eye popping astronauts eye view video combining all the descent imagery – here. The landmark Chang’e-3 mission marks the first time that China has sent a spacecraft to touchdown on the surface of an extraterrestrial body. Today, Jan. 3, marks the 10th anniversary since the safe landing of NASA’s renowned Spirit rover on the plains of Mars on Jan. 3, 2004. Spirit comprises one half of NASA’s now legendary pair of Mars Exploration Rovers (MER). Opportunity, her twin sister landed, on the opposite side of the Red Planet three weeks later – on Jan. 24, 2004. The goal was to “follow the water” as a potential enabler for past Martian microbes if they ever existed. Together, the long-lived, golf cart sized robots proved that early Mars was warm and wet, billions of years ago – a key finding in the search for habitats conducive to life beyond Earth. Exactly a decade ago, the famous robot survived the scorching atmospheric heating of the 6 minute plunge through the thin Martian atmosphere, bounced some two dozen times cocooned inside cushioning airbags, and gradually rolled to a stop inside 100 mile wide Gusev Crater. It was known as the “6 minutes of Terror”. The three petaled landing pad opened and Spirit was dramatically born in a milestone event that will be forever remembered in the annuls of history because of the groundbreaking scientific discoveries that ensued and the unbelievable longevity of the twins. Before they were launched atop Delta II rockets in the summer of 2003 from Cape Canaveral, the dynamic, solar powered robo duo were expected to last a mere three months – with a ‘warranty’ of 90 Martian days (Sols). Either dust accumulation on the life giving solar panels, an engineering issue or the extremely harsh Martian environment was expected to somehow terminate them mercilessly. In reality, both robots enormously exceeded expectations and accumulated a vast bonus time of exploration and discovery in numerous extended mission phases. No one foresaw that Martian winds would occasionally clean the solar panels to give them a new lease on life or that the components would miraculously continue functioning. Spirit endured the utterly extreme Red Planet climate for more than six years until communications ceased in 2010. Opportunity is still roving Mars today, and doing so in rather good condition! Altogether, Spirit drove 4.8 miles (7.73 kilometers),that’s about 12 times more than the original goal set for the mission. She transmitted over 128,000 images. After landing in the dusty plains, she headed for the nearby Columbia Hills some 2 miles away and ultimately became the first Martian mountaineer, when she scaled Husband Hill and found evidence for the flow of liquid water at the Hillary outcrop. The rovers were not designed to climb hills. But eventually she scaled 30 degree inclines. The rover was equipped with a rock grinder named the Rock Abrasion Tool (RAT) built by Honeybee Robotics. Spirit ground the surfaces off 15 rock targets and scoured 92 targets with a brush to prepare the targets for inspection with spectrometers and a microscopic imager, according to NASA. Eventually she drove back down the hill and made even greater scientific discoveries in the area known as ‘Home Plate’. Spirit survived three harsh Martian winters and only succumbed to the Antarctic-like temperatures when she unexpectedly became mired in an unseen sand trap driving beside an ancient volcanic feature named ‘Home Plate’ that prevented the solar arrays from generating life giving power to safeguard critical electronic and computer components. In 2007, Spirit made one of the key discoveries of the mission at ‘Home Plate’ when her stuck right front wheel churned up a trench of bright Martian soil that exposed a patch of nearly pure silica, which was formed in a watery hot spring or volcanic environment. Spirit was heading towards another pair of volcanic objects named ‘von Braun’ and ‘Goddard’ and came within just a few hundred feet when she died in the sand trap. See Spirits last panorama below – created from raw images taken in Feb. 2010 by Marco Di Lorenzo and Ken Kremer. “In the Columbia Hills, we discovered compelling evidence of an ancient Mars that was a hot, wet, violent place, with volcanic explosions, hydrothermal activity, steam vents — nothing like Mars today. “At Opportunity’s landing site, we found evidence of an early Mars that had acidic groundwater that sometimes reached the surface and evaporated away, leaving salts behind. It was an environment with liquid water, but very different from the environment that Spirit told us about. Meanwhile, NASA’s new Curiosity rover just celebrated 500 Sols on Mars and is speeding towards Mount Sharp from inside Gale Crater – which is about the same size as Gusev crater. And a pair of newly launched orbiters are streaking to the Red Planet; NASA’s MAVEN and India’s MOM. And China’s new Yutu lunar rover and Chang’e-3 lander are napping through the lunar night until mid-January. Stay tuned here for Ken’s continuing Curiosity, Chang’e-3, SpaceX, Orbital Sciences, LADEE, MAVEN, Mars rover and MOM news.